Tennis Passions is a free dating site for tennis players. Join for free and take advantage of free email, chat, forums and more. Love playing tennis? Looking for other tennis players? Check out Tennis Match for a site filled with people who are SERIOUS about tennis. It only takes a few minutes to sign up and check out 'the goods'. 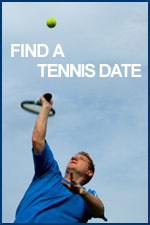 Looking for a site where you are surrounded by other single tennis players? On Find a Tennis Date, everyone is either a tennis player, a raquetball player, or they are interested in learning how to play. Take advantage of your common interest to break the ice and ask someone out for a friendly match. Join for free and find a tennis partner today. Looking for someone to play with? Why not join a site filled with tennis players and tennis fans! Join for free and check out the fun features available on Tennis Dating. "Mesh Tennis is a social network for people who want to play more tennis. We want to connect everyone in the tennis world! Create a tennis profile so you can find others and they can find you. Review your own gear and read the reviews by others. Form Groups which can be social, a club team, a school team, or just a doubles team and schedule Events. Record your matches online, read the latest tennis news and more is on the way!"